Another masterpiece – perhaps the masterpiece – from Strauss' final period, Metamorphosen varies four main themes in a symphonic adagio longer than many symphonies. The polyphony and thematic development show Strauss at his most technically complex, and for once the counterpoint isn't Strauss' usual trick of noodling around a common chord. The work also shows how far Strauss, like Wagner in the Siegfried-Idyl, had traveled from not only classical form but the Lisztian idea of organic form. He sustains a work of about 25 minutes without the usual program or any of the classical signposts, through a sure, dramatic manipulation of four primary themes. These traits, as well as a force consisting only of strings, make the piece hard to put across. Furthermore, despite its somewhat abstract title, the work packs an emotional punch; Strauss wrote it after the Allies had bombed several German cities to rubble. With its title from late Goethe (whom Strauss was reading at the time) and its thematic reminders of Beethoven and Wagner, it serves as a memorial to the highest in German culture. Solving the considerable technical problems of the work will not suffice for a fine performance. The nostalgia and the despair of the piece must also come through. Barbirolli brings plenty of intensity, but not much discrimination, to the work. Almost every passage is played at the same level. Climaxes are not felt as such because the work tends to become, in a sense, all climax. Barbirolli provides no evidence of planning to delineate the overall structure of the work. Not surprisingly, the string tone reduces to a monochromaticism, counter to Strauss' intent. Strauss, after all, designates the piece for 23 solo strings, not merely for the weight of sound, but for stressing different distributions. This Barbirolli also misses. 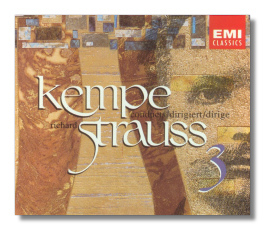 In this classic account, Kempe demonstrates his eminence as a Straussian. He solves all the technical puzzles of the work. Not only is each entry of the four primary motives clear, but you also hear much subordinate figuration normally lost in the intricate counterpoint. Furthermore, Kempe manages to make apparent the changes in string color throughout the work. In this performance, like in few others, you immediately apprehend the large structural pieces – an adagio introduction and conclusion framing a central fantasia in three main parts. As an emblem of the care Kempe takes, we can point to the canonic entries of the "Eroica" theme at several widely-separated climaxes in the score. Kempe ratchets up the intensity each time, until the final occurrence practically screams at you. He also knows how to fall back and to decrescendo over a long stretch so that he can build up again. The Dresden strings put out plenty of unforced volume when called upon but also manage the chamber-music textures and chamber-like sensitivity and alertness to one another. Not only does Salonen drag out the long introduction to the point where it loses its pulse, but he breaks up the phrases in what I suppose he intends as an "arresting" way, as if the piece hadn't enough interest on its own. This interpretation consists of momentary effects and exaggerations. The slow tempos drag (it comes in about 3 minutes behind the field), the fast sections whiz by to the point of inaudibility, the loud sections bid fair to blow out your tympana. Unfortunately, despite some wonderful playing from the string ensemble, Salonen never convinces you that anything in the music itself dictates these antics. The conductor, rather than the music, gets your attention, much like a dog walking on its hind legs, and at the same artistic level. A surprisingly fine account from Karajan's late period. Although the textures lack the clarity of Kempe and the Dresdeners, they are clear enough to let the main figures through. Karajan doesn't aim for Kempe's intensity either. He reins in emotion at the climaxes, in favor of a dignified grief. The canonic entries of the "Eroica" theme, for example, aren't Kempe's blows, but the eloquent outcries of an old man. This throws the final "Eroica" quotation into even sharper relief. I don't particularly care for the smooth orchestral attack Karajan favored as he grew older. Here, the massed strings sound "spongy," and the ensemble sounds as if it threatens to crumble, although I admit it never does. The introduction – slow, intense, and constantly moving forward – promises one of the great Strauss performances. Unfortunately, Dohnanyi can't keep the promise. Things fall apart at from the beginning of the fantasia to just before the first big climax. It's difficult to say what goes wrong. The intensity is still there. Dohnanyi steps over the textural traps as if they didn't exist. You hear the shifts in texture as different players combine and recede. However, everything sounds at the same emotional level. It's as if, for that section, Dohnanyi does not know how or when to back off. At the first climax, he settles into a good, though not a great reading. The coda, however, reminds you of the glory that he missed. Dohnanyi takes it directly, without pushing, so that this summit of the composer's art begins to sound like the old man simply singing, after all. Like Dohnanyi, Blomstedt misses an opportunity for something extraordinary. This fine account could have been a great one. You see immediately what Blomstedt aims at: a "Brahmsian" interpretation, elegant, eloquent, and elegiac. Instead of Kempe and Dohnanyi's super-clarity, Blomstedt strives for great warmth from the strings – a choice that in his hands makes a very good trade. Like Salonen, Blomstedt takes a very slow tempo in the adagio sections. Unlike Salonen, he finds the emotional tone to match the tempo and the line never breaks or plods through goo. He gives you the large structural outline of the work, although with fewer details than others. It's also a convincingly idiosyncratic view: he emphasizes certain sections and holds back on others normally stressed. Blomstedt has searched this score like few other conductors. In the end, he reins the music in too much. The fortissimo high G and the ensuing ringing silence, which mark not only the end of the central fantasia but also one of the work's dramatic peaks, seems perfunctory. Blomstedt acts as if he just wants to get on with it. At this point, you realize he has never allowed the music its passionate due. Even Brahms occasionally weeps. For Strauss, where if not here?